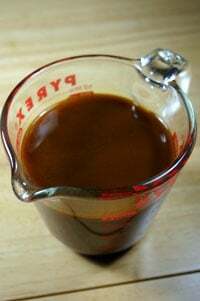 Demi-Glace is referred to as a “mother” sauce in French cooking. You don’t often use it as is, but it spawns many other tasty sauces. Traditional demi-glace is made with two ingredients: brown stock (usually veal-based) and brown sauce (Sauce Espagnole). I needed demi-glace for the Tarragon Tomato Sauce I’ll be making to accompany my Chicken Apple Meatloaf for this week’s SundaySupper, but I didn’t have any veal knuckles handy. Fortunately, I found a lower-maintenance recipe for demi-glace in the Tupelo Honey Cafe’s cookbook (which is where the meatloaf recipe comes from anyway). No veal bones required. Make this sauce and then freeze it for later. I use it as a replacement for beef stock when I want a dish to have richer flavor with more body. Heat oil in heavy saucepan over medium-high heat, then add celery, onion and carrots. Cook, stirring frequently, until onions are just beginning to caramelize, about 10 minutes. Add wine and cook until reduced by half, 5 minutes or so. Add stock and tomato paste. Blend well, decrease heat to medium-low and simmer until the sauce decreases in volume by one-quarter, about 25 minutes. Cool, strain and refrigerate for up to 2 weeks or freeze for up to 3 months. I’ve provided nutritional information for a serving size of 1/2 cup. When you use the demi-glace in another sauce, 1/2 cup will probably serve 4 people, so don’t be too thrown by the amount of sodium in this recipe. Never made this before ! Interesting. Beats regular gravy for sure ! Must be bursting with flavor ! My chef and I were just talking about this! How we use demi so much in the restaurant, but home cooks don’t really. And that there aren’t any great demi retail brands! Thanks for the recipe! It’s amazing on EVERYTHING!